Carbon Fibre Composites Market, one of the pronounced verticals of polymers and advanced materials domain, over the years, has witnessed a commendable surge with regard to its application arena. The worldwide carbon fibre composites industry in 2016 held a revenue of USD 16 billion, driven by its efficiency oriented demand from myriad end-use sectors, profoundly the aerospace and automotive. The rising trend of reducing overall vehicle weight and improving fuel efficiency, as per reports, has been one of the most crucial factors propelling carbon fibre composites market demand in these sectors. Moreover, superior material properties including high strength to weight ratio, low maintenance, and outstanding resistance to high temperatures have garnered massive proceeds for the industry over the years. In terms of market size, Global Market Insights, Inc. projects the overall carbon fibre composites market to register a demand over 290 kilo tons by 2024. Considering the material development and demand, carbon fibre composites industry has scored its major commercial success in the aerospace market. Aircraft industry giants such as Boeing and Airbus had been rigorously experimenting with carbon fibre composites for several years, however, the material was never used for huge structures such as the body or wings. Nonetheless, the scenario gradually changed with the Boeing 787 Dreamliner, which made use of carbon fibre composites for the main structure, accounting for about 50% of total weight of the plane. Speaking along similar line, another aircraft manufacturer major – Airbus, followed the footsteps, with its A350 XWB and A380 widebody platforms that significantly accelerated the use of carbon composites to reduce fuel consumption and emissions as well as propagated longer design life and lower maintenance. Experts claim such initiatives undertaken by the leading manufacturers to create quite a stir in the growth landscape of carbon fibre composites industry. Another instance which stands to testify remarkable growth avenues for carbon fibre composites market is the launch of Stratolaunch. Developed by a renowned player of aerospace composites market, Scaled Composites, Stratolaunch is touted to be world’s largest aircraft by wingspan. As per reports, the entire aircraft structure is incorporated with carbon fibre composites structures to make the aircraft higher in strength and lighter in weight. Further enrooting its presence & position in carbon fibre composites industry, Scaled Composites, in 2016 launched its all-carbon fibre composite rocket plane dubbed as the SpaceShipTwo in the market. These instances depict a clear picture of the operational benefits of structural composites in aerospace industry, which, in turn, is driving carbon fibre composites industry share. Given the outstanding growth of the military and commercial aerospace sector, analysts anticipate carbon fibre composites market from the aerospace application to account for largest share outstripping USD 19 billion by 2024. Speaking of the carbon fibre composites industry potential in other application sectors, the automotive industry is growing in similar fashion as the aerospace, and is anticipated to exhibit the highest growth rate of 13% over 2017-2024. It is prudent to note that despite having a plethora of niche applications in the field of aerospace, fibre composites are gradually inching toward being deployed in vehicle production, as the automotive sector seems eager to embrace these products for highly efficient and robust automobile development in the future. As per estimates, carbon fibre composites industry demand from automotive sector held a demand of 25 kilotons in 2016 with a ration of 20% of the overall share. Apart from carbon fibre’s obvious use because of its properties, the most recent standards by CAFÉ, which requires significant increase in vehicle fuel economy by 2050, are further slated to provide a remarkable push to the carbon fibre composites market size in the ensuing years. Global Market Insights, Inc., forecasts the overall carbon fibre composites market size to surpass USD 31 billion by 2024. Oil & gas, railway, marine, and wind energy market, as per industry experts, have been touted as the most potential growth arenas for the industry demand. Though aerospace and automotive sectors have been the bright spots of carbon fibre composites market in terms of volume and revenue, the aforementioned applications are slated to emerge quite strong in terms of exploiting the operational benefits of CFC components. Thanks to the increased size of exploration and production activities, high demand for speed rail, and increasing size of wind turbine installations. All these applications significantly require the use of stronger and more lightweight materials, which is substantially fueling the growth track of carbon fibre composites market. 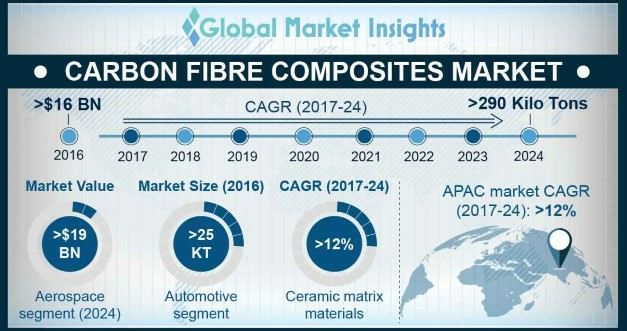 As these application arenas have finally started to ramp up, analysts predict carbon fibre composites industry to witness major a boost pertaining to its commercialization and profitability landscape. In terms of fiscals, the CFC components are on the higher side than the metal components. However, various advancements in raw materials, assembly techniques, and manufacturing technologies are anticipated to assist in reducing the costs of composites, which will significantly stimulate carbon fibre composite market size. Industry analysts further predict that the growing commercialization matrix of carbon fibre composites industry in aerospace, marine, automotive, natural gas, and railway will further eventually drive down the cost of CFC components in the ensuing years. Moreover, despite the high material cost, analysts anticipate the technological advancements to secure promising growth prospects for carbon fibre composites market in the years ahead.